Ah, now I see it. 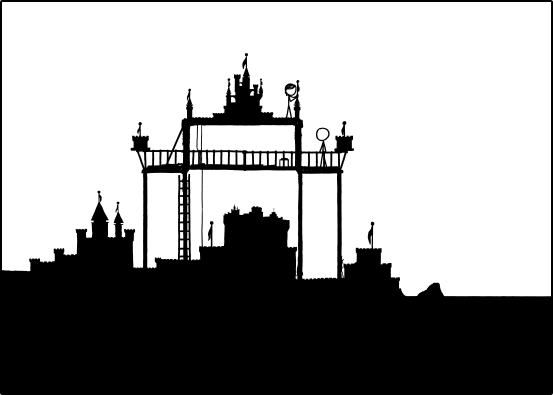 Then I think there is at least four flags, also adding a flag to the rightmost tower. BlitzGirl is online, enduring her quest By the time you get here, I predict the thread of Time has slowed down enough for you to see the end in sight. Do your own analysis of when she'll catch up. Maybe I was wrong before looking at this graph. It looks like the velocity of posting is more or less constant since BlitzGirl started her quest. (Spoiler tagging the large image, which I quoted differently to have it display). Last edited by Jonas79 on Wed Apr 24, 2013 11:54 am UTC, edited 1 time in total. Yes, noted that... Oh well, we'll Wait for it. Quest progress: 359 out of 397 pages. The Next Level. NP 715. Okay, just had a miserable time on page 358 due to the extensive rot-13 and some things that looked like rot-13 but weren't. Please leave all future rot-13 posts back in the 1980s where they belong. I know I'm somewhat stuck in the past, but I wasn't even born yet during the rot-13 heyday. histrion wrote: Psst! Blitzgirl! Psst! 2. if you're using Google Chrome, install the d3coder extension - then you can just highlight the text you want to decrypt, right-click, and pick d3coder -> rot13 decode from the context menu. Thank you - I've been doing this ever since I ran across my first rot-13-ness. Now a more sincere THANK YOU! That seems reasonable. I will hopefully be there soon! lmjb1964 wrote: Blitzgirl, you don't need to beware of the tears (rhymes with beers) so much as the tears (rhymes with bears). Just thought I'd clarify that. I do appreciate the clarification, but that doesn't really make the warning any less cryptic. chem1190c wrote: Hey, wait a minute.. Blitzgirl?! How'd you learn to fly the Tardis? Don't ask me - that must happen to my future self. RobIrr wrote: More plan(c)ks ? Drakeesh wrote: Oh and, Go BlitzGirl! For the internet's sake, I no longer post every time I cross a signpost. manvandmaan wrote: To hurry along BlitzGirl, we could ask the mods to start deleting1 posts. If they start at post #1 and go upwarths, it should create a sort of "caving in" effect behind BlitzGirl (like in the movies! )that should spur her on to go faster! If it works and also she makes it, her arrival into the present shall be even more epic! 1 AFTER making a back-up offcourse! 2 A word I thought I'd never be able to use. This would also make my percentage of the thread read suffer miserably. Though I do like the idea of BlitzGirl 2.0. There were officially 106 mentions of my name on newpage 356, when sigs and quotes were included. Yikes. Angelastic wrote: Let's continue to increase the frequency of discussions of BlitzGirl, such that when she reaches the present, the discussion will be all Being John Malkovichy/Sustainable. BlitzGirl! BlitzGirl BlitzGirl BlitzGirl BlitzGirl? Blitzgirl, Blitz? Girl. BlitzGirl BlitzGirl. BlitzGirl BlitzGirl! Buffalo Buffalo buffalo buffalo had had sustainable BlitzGirl Time time! Blitzgirl!!! Blitzgirl Blitzgirl Blitzgirl Blitzgirl...Blitzgirl? Blitzgirl! ...Blitzgirl? Blitzgirl Time! Time time time! Blitzgirl blitzgirl Blitzgirl!!! Time? time! Time! Buffalo buffalo buffalo time time Blitzgirl ! Okay, I was in a half-coma state when I read this, following a bizarre coma-hallucination I had regarding Time. This is not BlitzGirl helping things Buffalo buffalo. And now to Blitzgirl blitzgirl buffalo Time time! Time-buffalo! With maybe a few bits floating and possibly a large iceberg. Though the spam filter and my inability to post images has made this simple post quite a difficult one to make. Indeed, five flags, for those of us¹ who had trouble counting. She managed to place all of them without doing any damage. Impressive. BlitzGirl wrote: Quest progress: 359 out of 397 pages. mscha wrote: Seawall done. What shall we do now? Wait; haven't we been here already? jjjdavidson wrote: Wait; haven't we been here already? Yes, but you shouldn't be able to remember it. Did your parents perhaps take a TARDIS for their honeymoon? Wasn't the PFAN of the Timewaiters abolished? There's a new church (something like Church of the Newpage) that has a PFAN, but that's decided by the last post. I still declare myself Vatican Milliner's Perfect Customer when I hit the top of a page. Call me old-fashioned, but I like it. Surprised that wasn't done earlier. Sounds like yet another thing to add to the shop. Oh my god these just keep getting better, don't they? BlitzGirl wrote: Okay, just had a miserable time on page 358 due to the extensive rot-13 and some things that looked like rot-13 but weren't. Please leave all future rot-13 posts back in the 1980s where they belong. I know I'm somewhat stuck in the past, but I wasn't even born yet during the rot-13 heyday. I have no idea what you said, so I'm going to assume it's a compliment, and dunk you Chocolate syrup and cover you in chopped licorice. What, I'm a man of my word. Before you taint it with the corpses of the unfaithful, please may I have some for my ice cream? That was great! jovialbard, you should sig the link to your song so Blitzgirl can see it in the Past. I hate to ask, but I also don't want to remain hatless in a sea¹ of hats. So... could you perhaps be so kind to make a hat for Dogbert? Last edited by mscha on Wed Apr 24, 2013 1:24 pm UTC, edited 1 time in total. 2Racists put us in the monster manual. They have been noted by the inquisition. mscha wrote: She managed to place all of them without doing any damage. Impressive. Last edited by manvandmaan on Wed Apr 24, 2013 1:17 pm UTC, edited 1 time in total. That was great, well done! No self-deprecation necessary. Time for a sea¹² level update. The sea wall has eroded, a bit on the sea side, but quite a bit more on the land side. Not surprisingly, Megan has been sitting in it. The ground level behind the wall has risen a tiny subpixel bit. Not sure if that's sand³ or water⁴, though. ³: or pixels, toner, whatever. The end is near! Repent! Repent! repent to any religion of choice. Neil_Boekend wrote: repent to any religion of choice. Which one gives the best discount? Come on, Cueball, go do something interesting. Thanks, guys (and to everyone else with the positive feedback). I don't think I'll put it in my sig, but I will note in my sig that a present is waiting for her on page 395. The Megan period ended when she woke up and then the collapse and reconstruction started.